Lindbergh's panel-- Ryan NYP-- what is this instrument and how was it used? The lower (vertical) part is some sort of pitch level. It is calibrated to show pitch attitude. The glass tube may possibly have a part that we can't see, that disappears into the panel. So why how was the vertical glass tube intended to be used? Was it intended to provide useful information in cloud? If so, would it actually have provided any useful information, or not? Or was it just intended to display a precise measure of the aircraft's pitch attitude and thus angle-of-attack, during unaccelerated straight-and-level cruising flight in visual conditions, for the purpose of optimizing the airspeed and angle-of-attack for long-range cruising flight? The calibration suggests that the instrument was intended more to detect large deviations than for fine-tuning the angle-of-attack in cruising flight in visual conditions, but it is hard to see how this would be of much practical use during actual cloud flying. It's pretty much analogous to a simple pendulum, but with more damping. In the early 1920's, the US Government contracted Rieker Instruments Company to produce bubble style pitch and roll indicators for the fast emerging aircraft market. 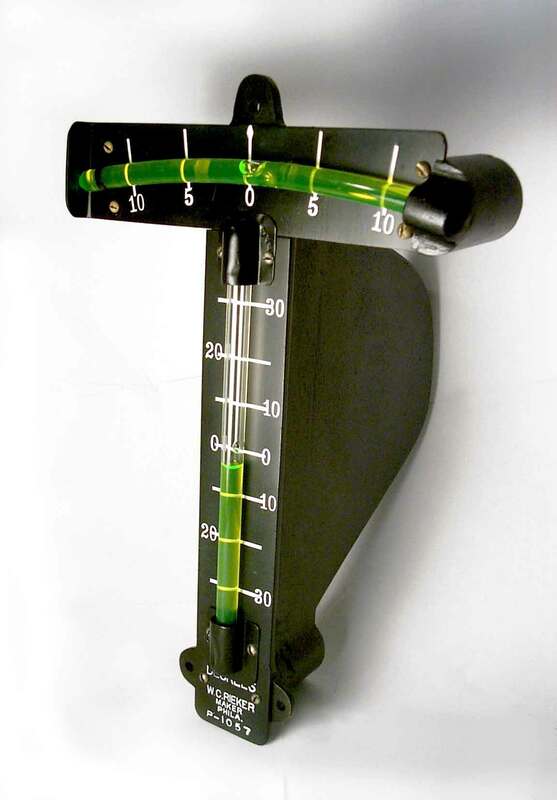 One of the most famous inclinometer fluid filled vial type installations - if not the most famous - was the use of a pair of Rieker glass tube instruments on the panel of the Ryan NYP "The Spirit of St. Louis". In 1927 Charles Lindbergh chose the lightweight Rieker P-1057 Degree Inclinometer to give him climb and descent angle information. This was useful to the Spirit of Saint Louis as it had effectively no forward visibility with the exception of the periscope. He may have also chosen this in the interest of weight as it would be much lighter than an early gyroscopic instrument. Not the answer you're looking for? Browse other questions tagged aviation-history flight-instruments or ask your own question. What was the first plane that allowed walking during flight? What is the Boeing 727 AC Generator Panel Part Number? What was Boeing's competitor to the C-5? What aircraft manufacturer uses an HSI with DME, VOR, and G/S in one Instrument? What is this instrument that has “PACK” written on it and a temperature scale? What is the difference between an Instrument and Equipment? During “partial panel” flying, in what ways is a turn rate indicator more useful than a turn coordinator?